Today’s defence related news includes coverage of the discovery of the remains of Royal Navy explorer Captain Matthew Flinders. BBC Breakfast, BBC Radio 4 Today, Sky News, ITV News, Metro, Telegraph, Evening Standard, Guardian, and CNN all report on the discovery of the remains of Captain Matthew Flinders by archaeologists working on the HS2 project in St. James’s burial ground, Euston. Captain Flinders led the first circumnavigation of Australia in HMS Investigator and is credited with giving the country it’s name. Matthew Flinders is one of those iconic characters from the golden age of the Royal Navy. He’s a household name in Australia but far less so here in his native land. He’s very much a forgotten hero of discovery. Hopefully, thanks to his grave being rediscovered after nearly two centuries of being lost, people will also rediscover Matthew Flinders the explorer and he can take his place alongside many legendary Royal Navy explorers such as Cook, Franklin and Scott. We’re glad his journey is now over. 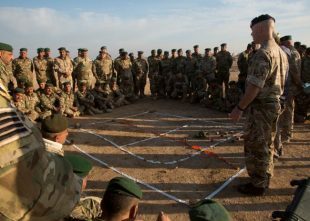 A British soldier assigned to Task Force Besmaya uses engineer tape to teach a class of Iraqi soldiers where improvised explosive devices (IED) are likely to be placed during an IED course at the Besmaya Range Complex, Iraq.